Today’s kitchens are not simply places to cook a meal, but rather they have become special, unique spaces in which to socialize, enjoy good food, and make memories with family and friends. Kitchens have moved beyond being practical spaces to being luxury areas where people can gather to relax and enjoy. The Republic West Remodeling team of experts has compiled some of the more popular luxury kitchen remodeling trends we have observed in 2017. We suggest you consider these trends if you are currently selecting features for a luxury kitchen remodeling project. Many of these enhancements can make your kitchen the ultimate entertainment oasis for family and friends alike. Double sinks, double ovens, double matching light fixtures; it is double everything this year. We have to admit that having two ovens can be extremely helpful when you are cooking numerous dishes for one meal. The same goes for double sinks: with one main, deep sink, paired with a small prep sink incorporated into your kitchen island, meal preparation becomes much more efficient. From no-pull cabinetry and induction stovetops to hidden electrical outlet strips installed underneath smooth countertops, sleek, seamless surfaces have been trending this past year. Seamless design also helps keep your kitchen clean, neat, and tidy. One single light source does not typically do a kitchen space justice. 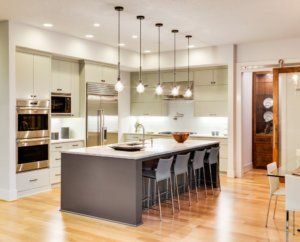 In fact, a lot of different types of tasks have to take place in the kitchen, so a healthy combination of under-counter lighting, island pendant lighting, and recessed lighting can help enhance food prep, dining, and even conserve energy. Pizza ovens, steam heat ovens, warming drawers, and more; today’s luxury custom kitchen remodeling projects are catering to particular dietary needs and the increasing attraction to a healthy diet and lifestyle. One way to embrace the continued minimalist trend is via smart storage. Reduce counter clutter and store appliances, such as your toaster, blender, coffeemaker, or coffee bean grinder, behind a closed, easy-to-open door. At Republic West Remodeling, we make it our goal to provide a design and construction team with whom you can exchange ideas and create your luxury kitchen. Our team of kitchen remodeling professionals can help you decide which luxuries are worth the investment, and which ones are not. Best of all, we strive to make the remodeling process painless and enjoyable. Contact us today for your complimentary design consultation.